The Mitchell Museum of the American Indian displays a figure of a fisherman wearing a seal-gut parka in a kayak and an ivory mask, both from the arctic or subarctic region. The museum unveiled its exhibit of miniatures Saturday. 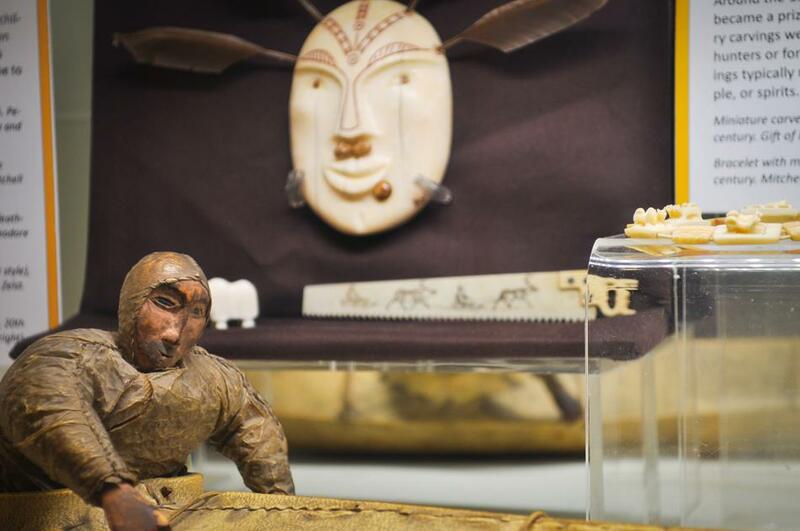 An Evanston museum opened a new exhibit Saturday featuring miniature items from various native communities across the United States and Canada. The exhibit, “Miniature Artwork — Enormous Appeal,” will be on view for the next year at the Mitchell Museum of the American Indian, 3001 Central St., which focuses on Native American history, arts and culture. Housed on three shelves at the museum, the exhibit includes around 40 miniature objects that reflect the diversity of native cultures from the 1900s to today, said curator Janelle Stanley. It includes items such as an ivory kayak figurine from Alaska; bronze carvings, wooden totems and masks from the Northwest regions; patterned woolen Navajo blankets and silver seed pots from the Southwest. However, Stanley also said objects such as the doll-like Katsina figurines made by the Hopi tribe in Arizona were used as teaching tools for children to learn about values such as responsibility. For Stanley, the most “astounding” aspect of the exhibit is the disparity in size between the miniature objects and their regular-sized counterparts, which are also featured in the exhibit. The smallest item in the exhibit is a silver micropot that measures only half an inch in both diameter and height, Stanley said. Stanley, who herself is from the Dine tribe, known more commonly as the Navajo, said such exhibits are great ways for the public to learn more about native cultures. Similarly, Allan Niederman, a longtime collector of native artwork who loaned around 20 items to the exhibit, said he is hopeful about the exhibit’s influence. “Museums like this help educate and spread both the art form and the culture (of native communities),” Niederman said. Another exhibit at the Mitchell Museum, for example, allows people to learn about the Seneca tribe, who have a culture that many people do not know about, he said. Ben Soper, a Chicago resident who attended the exhibit on opening day, said even though he does not hear about native cultures in everyday life, he left the exhibit with a new understanding about native communities. “(It’s) a good place to come learn, see stuff you wouldn’t normally see — actually learn the details about what everything represents,” he said.